Laser scanning is an efficient and highly accurate technology for 3D measurements and digitalization of complex facilities and layouts. The powerful tool can save both time and money on redesigns, keep design projects on schedule and provide valuable information. 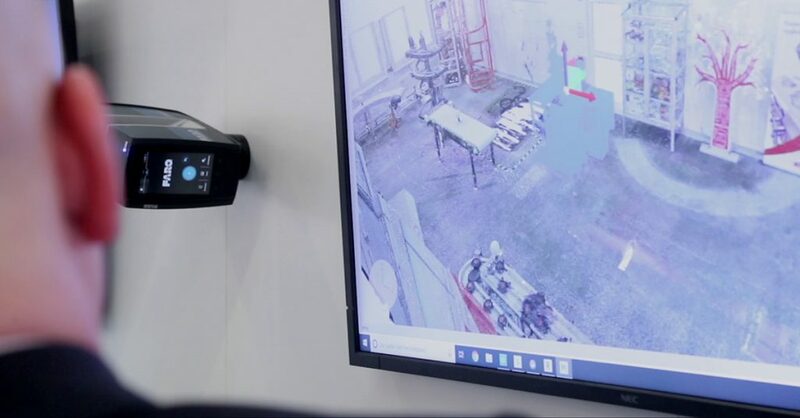 In this blog article, I will describe laser scanning, how it works and in what ways the technology can create high value for future factory developments. Laser scanning is a technology that digitally captures the shape of physical objects using a line of laser light. By identifying the exact size and shape of, for example, an object or a specific environment, the laser scanner collects data that enables the physical object to be transformed into a three-dimensional replica in the digital world. The technology has been used in engineering activities for more than 20 years, mainly in architectural design work. However, it has become more and more popular to use also in the manufacturing industry. A laser scanner is primarily used in situations where its efficiency in creating a digital copy of a production site provides added value. Many production owners consider building new production facilities or redesigning their current ones. However, in many cases, they lack updated plant layouts or documents on the existing facilities. In these situations, a laser scanner can provide the required data on existing layouts with the accuracy needed for further planning. If laser scanning is used throughout the entire development project, the new facility will have documentation from all the major milestones in the project. 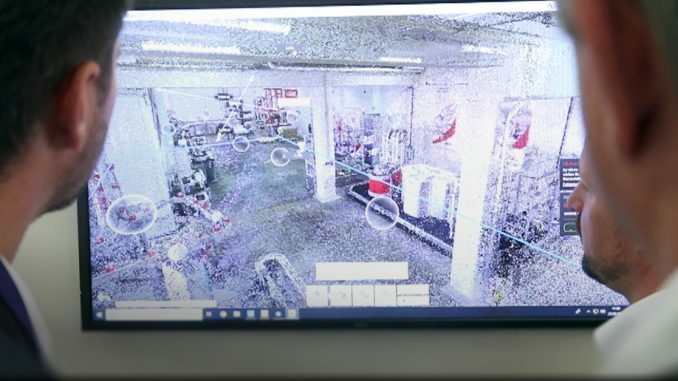 That means, the scanner can define what is behind the walls, above the ceiling and under the floor as well as create an overview of the machinery on site. This is valuable documentation that production owners can utilize throughout the production plant’s life cycle. There are many advantages of using laser scanning. The main benefit is the tremendous savings on efforts and resources for measurement and digitalization of the plant. Having a plant layout accurate to the millimeter can avoid costly reworks and help increase the use of the production floor. It is a fast, efficient, cost-effective and complete scan that captures an object’s exact position and dimensions. It creates a virtual walk through the factory and the data can be transferred to higher-level coordinate systems. Taking measurements without using laser scanning could potentially lead to mistakes in measurement accuracy that, in turn, could result in new equipment colliding with each other. This is often not evident before final assembly, which can cost both time and money for the production owner. In order to achieve a successful laser scanning, well-trained specialists position the laser equipment based on different reference points or scan locations. By taking distance measurements in every direction, the scanner rapidly captures the surface shape of objects, buildings, and landscapes. The time it takes depends on the desired resolution. In most cases, a single scan only takes about 10 to 15 minutes. After the scan is conducted, an engineer transfers the data to a CAD system in order to finalize the 3D model of the facility. Once the 3D model has been produced, it can be merged with our 3D system solution, creating a highly detailed, virtual view of the scanned location. Before scanning, it is important to remove all objects and equipment from the factory that do not need to be in the scan, or that can create shadows or disturbances on the scan. In other words, the production area should be clean and only contain the equipment and resources needed in the scan. It is also important that operators and people in the factory area are aware that the laser equipment and reference points must not be moved during the scanning process. Laser scanning is becoming a more and more accessible and popular tool to use for productions in the manufacturing industry. 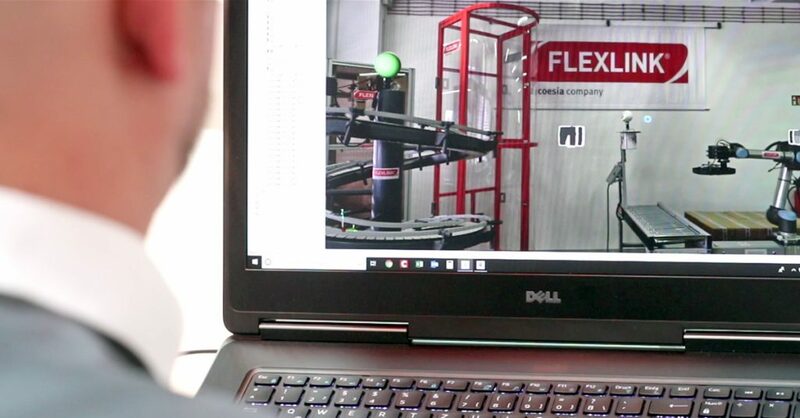 FlexLink has offered advanced simulation tools for over 15 years, and laser scanning is an interesting service for the future that helps create a smarter, more efficient and automated factory. I hope you enjoyed reading this blog article about laser scanning. Would you like to know more about FlexLink and our services? Please contact me with questions or visit our website or social media channels. Also, read more blog articles on this blog.